This paper investigates how scientific information and expertise was provided to decision-makers for consideration in situations involving risk and uncertainty. Seven case studies from the earth sciences were used as a medium for this exposition: (1) the 2010–2011 Canterbury earthquake sequence in New Zealand, (2) agricultural farming-system development in North West Queensland, (3) operational flood models, (4) natural disaster risk assessment for Tasmania, (5) deep sea mining in New Zealand, (6) 3-D modelling of geological resource deposits, and (7) land-based pollutant loads to Australia’s Great Barrier Reef. Case studies are lead-authored by a diverse range of scientists, based either in universities, industry, or government science agencies, with diverse roles, experiences, and perspectives on the events discussed. The context and mechanisms by which scientific information was obtained, presented to decision-makers, and utilised in decision-making is presented. Sources of scientific uncertainties and how they were communicated to and considered in decision-making processes are discussed. Decisions enacted in each case study are considered in terms of whether they were scientifically informed, aligned with prevailing scientific evidence, considered scientific uncertainty, were informed by models, and were (or were not) precautionary in nature. The roles of other relevant inputs (e.g. political, socioeconomic considerations) in decision-making are also described. Here we demonstrate that scientific evidence may enter decision-making processes through diverse pathways, ranging from direct solicitations by decision-makers to independent requests from stakeholders following media coverage of relevant research. If immediately relevant scientific data cannot be provided with sufficient expediency to meet the demands of decision-makers, decision-makers may (i) seek expert scientific advice and judgement (to assist with decision-making under conditions of high epistemic uncertainty), (ii) delay decision-making (until sufficient evidence is obtained), and/or (iii) provide opportunities for adjustment of decisions as additional information becomes available. If the likelihood of occurrence of potentially adverse future risks is perceived by decision-makers to exceed acceptable thresholds and/or be highly uncertain, precautionary decisions with adaptive capacity may be favoured, even if some scientific evidence suggests lower levels of risk. 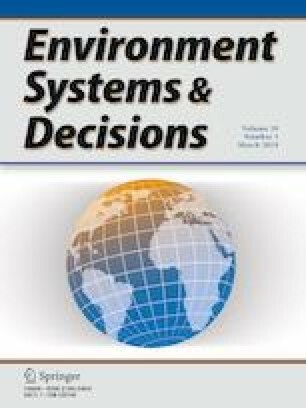 The efficacy with which relevant scientific data, models, and uncertainties contribute to decision-making may relate to factors including the expediency with which this information can be obtained, the perceived strength and relevance of the information presented, the extent to which relevant experts have participated and collaborated in scientific communications to decision-makers and stakeholders, and the perceived risks to decision-makers of favouring earth science information above other, potentially conflicting, scientific and non-scientific inputs. This paper provides detailed Australian and New Zealand case studies showcasing how science actions and provision pathways contribute to decision-making processes. We outline key learnings from these case studies and encourage more empirical evidence through documented examples to help guide decision-making practices in the future. The modelling conducted in case study 2 and analysis activities reported, and the development of the armonline.com.au tools were made possible through funding provided by the Queensland Department of Agriculture and Fisheries under the Department of Agriculture and Fisheries—University of Southern Queensland Broad Acre Grains Partnership. Dr Lance Pedergast (Senior Development Agronomist with the Queensland Department of Agriculture and Fisheries) assisted in the design, analysis and communication of chickpea analysis presented in this case study. Mr Howard Cox (Senior Agronomist Department of Agriculture and Fisheries) has contributed to the design and development of the ARM online tools. The author of case study 5 (PD) would like to thank Ray Wood and Renee Grogan for discussing many aspects of the CRP application and EPANZ hearing and decision. Their comments and suggestion greatly improved the original document. Hamish Campbell is also acknowledged for providing a thorough review of the draft. The authors thank the Australian Academy of Science (https://www.science.org.au/) for providing the opportunity to participate in the 2016 Theo Murphy High Flyers Think Tank (https://www.science.org.au/news-and-events/news-and-media-releases/2016-theo-murphy-think-tank-living-risky-world). From this intellectually challenging and stimulating event, this multi-disciplinary authorship team emerged, with broadened perspectives that benefitted the authors’ collaborative effort to tackle the challenging topics that are presented herein.